After the defeat of the great Doctor Shinigami, the Shocker Army needed a new general to command it’s forces in Japan. To destroy the Kamen Riders, a member of their American west coast organization was recruited. The deadly and dangerous, Ambassador Hell! Capable of assuming a Kaijin form as Gargaranda, the Ambassador is a force of pure evil in his humanoid form as well. Utilizing his trademark whip to bind his enemies and rally his forces, S.H. Figuarts Ambassador Hell is here to build a new Shocker Army all his own! Ambassador Hell joins the line at a time when the original Showa Kamen Rider series is getting more releases than it ever has. Expanding to villains has been something that S.H. Figuarts has always struggled with thanks to lower than average sales numbers. But the iconic greats like this can go a long way to reviving them in toy form. Joining the ranks of the various Shocker Combatmen on or coming to market this year, Ambassador Hell is a wonderfully interesting figure, though with a few faults. He’s sure to menace your Seihou Rider 1 & Rider 2 quite well though. We’ve attached the full 50+ image gallery to this post, but you can also read our full review of S.H. Figuarts Ambassador Hell after the jump by clicking “Discuss on the TokuNation Forums” at the bottom of this post. We’ll see you soon again for another action packed gallery! A special “Tamashii Caravan” event recently took place at the Parco store in Fukuoka, and among the numerous figure displays was the reappearance of the S.H. 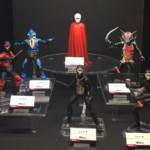 Figuarts Shocker figures previously seen at the Tamashii World Tour stop in Tapei! However this time in addition to the new body Shocker Combatmen, Great Leader and Garagaranda figures, the evil organisation was also joined by the fiddler crab monster Shiomaneking! As well as battling against Kamen Riders 1 and 2 in the original series, Shiomaneking would also go on to be revived in Kamen Rider V3 as well appearing in numerous crossover movies and even the Zyuohger crossover episode with Kamen Rider Ghost! While it’s important to note that none of these figures have a release date yet, Bandai Tamashii Nation‘s new interest in the wider world of Kamen Rider villains is very exciting! We’ll bring you more news as it comes!